New Jersey Devils general manager Lou Lamoriello has been involved in the business of hockey long enough that he says nothing surprises him anymore. Fair enough, but losing now-former captain Zach Parise to the Minnesota Wild on Wednesday certainly disappoints him. "He was our captain. He was our leader," Lamoriello said on a conference call not long after the Wild officially announced that both Parise and Ryan Suter signed identical 13-year contracts worth a reported $98 million. "He was a prototype Devil player the way he played. He was a great example for younger players. It's a loss, without question, besides the points he put up. That's an understatement and we'll leave it at that." The Devils chose Parise in the first round of the 2003 NHL Draft -- and until Wednesday he had spent his entire NHL career in New Jersey, putting up 410 points in 502 games and helping them reach the Stanley Cup Final this past season. Parise said Wednesday that he loved playing in New Jersey and it is a first-class organization, but he is from Minneapolis and the chance to play at home was too great -- especially with Suter by his side. Parise told Lamoriello that is why he chose the Wild over the Devils. Lamoriello, a former coach at Providence College, compared it to trying to recruit a player out of a state that has a good hockey program. He said that type of reasoning is not something he could fight. "There are a lot of considerations -- family, future, promises, future businesses," Lamoriello said. "You don't compete with it. You just put forward the experiences they've had with you and you try to do the best job you can of being honest. You can only point out what is best in your opinion, but you never derail or talk about somebody else negatively." Lamoriello also knew of Parise's hope to play with Suter, so he did reach out to Suter's representation to find out if there was any interest on his part in coming to New Jersey. The answer was that Suter wanted to stay in the Western Conference, so no contract offer was made. Lamoriello did make an offer to Parise in a face-to-face meeting in Toronto on the eve of the free-agent signing period. He said it was competitive to what Parise accepted from the Wild and there was never a counter offer made because Parise made it clear to Lamoriello that his decision was not about money. "The response was that the money we had offered would not be the issue and we did not get a return call from his representation to say that the number had to go up," Lamoriello said. "Going home was the real focus and the conversation that he and I had had nothing to do with money or our last offer. It was about his days here with the Devils and some personal comments." Lamoriello said Parise's decision to leave the Devils ranks with the disappointment he felt when defenseman Scott Niedermayer left New Jersey for Anaheim via free agency in 2005. "Certainly they were unique situations involved -- Scotty with his brother [Rob] and Zach told me if it was not going home to Minnesota it would be coming to New Jersey," Lamoriello said. 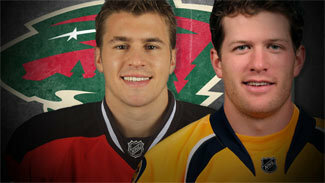 "It was one of the toughest decisions [Parise] said he had to make. I respect that. We can't get in the minds of people. In my opinion our organization did whatever we possibly could to retain him, and it's a decision he made." "He was our captain. He was our leader. He was a prototype Devil player the way he played. He was a great example for younger players. It's a loss, without question, besides the points he put up. That's an understatement and we'll leave it at that." While Lamoriello said "you can't replace a Zach Parise," his job now is to move forward to at least try to recoup some or most of what he lost in his captain. Without giving anything away, he said the Devils would do everything possible to remain one of the top contenders in the Eastern Conference. Lamoriello could look to the trade market or the free-agent market, which, of course, could quickly thin out now that both of the big names are off the board. But he also expressed a lot of excitement for the players who are returning to New Jersey, including Calder Trophy finalist Adam Henrique and 19-year-old defenseman Adam Larsson. Lamoriello is also excited because the Devils, who entered the offseason with 11 potential unrestricted free agents, have been able to bring back eight of 10 so far, including goalies Martin Brodeur and Johan Hedberg, defenseman Bryce Salvador and the entire fourth line of Stephen Gionta, Ryan Carter and Steve Bernier. Petr Sykora remains unsigned, but Lamoriello said there is interest in bringing the veteran forward back to New Jersey. "We will have to make some adjustments and transactions if possible," Lamoriello said. "But we will not turn our heads with reference to getting this team to where we feel we should be each and every year." As for naming a new captain to replace Parise, that's not even close to being a priority now for Lamoriello. "We have a lot of leaders here," Lamoriello said. "I don't feel that leadership is going be a problem."